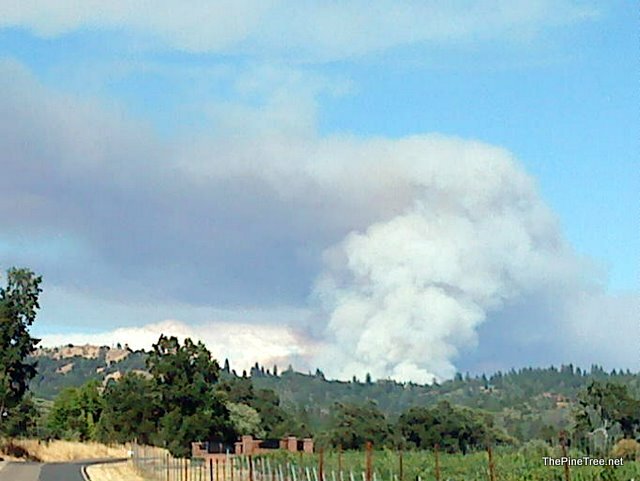 The fire is burning in the Middle Fork Stanislaus River Canyon and potentially threatens the small, remotely located summer cabin subdivision of Mount Knight. In some places, the fire's perimeter is within 1/4 mile of the subdivision. Although no official evacuation order is in place at this time for the subdivision, the Forest is working closely with Tuolumne County Emergency officials and and the Tuolumne County Sheriff's Department, and has developed a contingency plan with decision points in the event that an evacuation becomes necessary. Most Mount Knight residents have already elected to voluntarily leave the subdivision at this point in time, due the proximity of fire activity. Update: 7-27 1200hrs - According to Pat Kaunert of the Stanislaus National Forest the Knight Fire has already been classified as a "campaign" fire which means it will last for at least several burn periods or days. Officials are estimating the 275 acre fire will last through the week. Air Quality Alert: Smokey Conditions Will Persist in Sonora, Due to the size, intensity and location of the Knight Fire smokey conditions will continue to deteriorate air quality in the Mother Lode area, individuals with asthma, emphysema or heart disease should avoid outside air as much as possible. Update: 7-27 1100hrs - Yesterday's normal upcanyon afternoon winds fanned the fire, and the fire is now well established in the rugged canyon terrain, burning in heavy fuels including brush and timber, conditions continue to be very dry with today's expected temperature to be 95-100 degrees, and humidity to be about 11-15%, with 2-8 mph upcanyon winds gusting to 12 mph over peaks and ridges. The Forest ordered a type 2 Incident Management Team late yesterday afternoon, with expected arrival at 1000 hours today (7/27). Additionally, the following firefighting resources have been ordered with expected arrival today: fifteen Type 1 (twenty person) hand crews; six dozers; ten engines; two water tenders; six air tankers; 5 helicopters; and additional overhead and support personnel. Once filled, these orders will bring the total personnel figure to about 550+ firefighters dedicated to the incident. Update: 7-27 1000hrs - BDF is sending a strike team. Update: 7-27 0910hrs - Sacramento CDF just released: 275 to 300 acres. Successful during the night getting Dozer line around the Mt Knight sub-division and they will continue to fire out around the housing division. Because of step terrain and rocky slopes this will be a Air/Crew show until it moves out of the canyon. CDF Command Team #7 (McClelland) on call this week for Southern Ops Area. There is discussion of a unified command due to SRA threat. Update: 7-27 0800hrs - Per South OPS GACC(link): Knight- CA-STF-002207 Fire is 275 acres, 0% containment. Evacuation of Mount Knight started yesterday. Dozer line construction along the ridge of the Middle Fork of the Stanislaus River continued in support of firing operations to protect the community (approximately 30 homes). Update: 7-27 0600hrs -275+ acres, . According to USFS's Pat Kaunert overnight they were actively fighting the fire overnight and setting backfires. They are working on building a dozer line around the Mt. Knight subdivision to protect it. Firefighters reported intense overnight burning in this heavy fuel laden area. Today the resources on the fire will rise significantly approximately 500 personnel on the fire. Update: 2341hrs - Scoop on the Hotlist(Link) - Was told it was going to be Allen Johnson's team. This fire is going to be getting bigger. Very difficult location and no real good places to tie it into. There are about 50 home threatened in the Mt. Knight area. Fire is on FED DPA but I'm hearing the possibility of Unified Command with SRA just on the other side of the river. Fire started mid-slope and had active crowning and spotting and expecting similar behavior with similar weather tomorrow. Expect heavy resource commitment. Be safe all. Update: 1930hrs - Per South OPS GACC(link): Knight- CA-STF-002207 Fire is approximately 150-200+ acres of brush, grass, down timber heavy slash near Mount Knight area of Tuolumne County, north/east of Columbia and north of Twain Harte. Los Padres HS, Arrowhead HS, Kern Valley HS, Springville HS and American River HS along with 3 Strike Teams of Type 1 Handcrews (CALFIRE) have been mobilized to fire. Tuolumne County Hotshot reunion: American River Hotshots, Los Padres Hotshots, Springville RHC and Kern Valley IHC en route. Update: 1735hrs -Heavy Heli-tanker en-route from Mariposa. Relief air attack was ordered for 1830hrs, AA-230 replaced by AA-17 from Grass Valley. Sheriffs office enroute for possible evacuations. Mount Knight summer cabin subdivision, no evacuations had been called yet. home to 50 to 75 campers during the summer season. Update: 1655hrs - 1 additional type 2 copter and 1 add type 3 air tanker ordered. Also Tuolumne County engine ST dispatched. 4 additional dozers plus 5 additional type 1 crews. Update: 1640hrs -Ice Cap. 100-150 acres crowning. Update: 1630hrs - Per AA 100 acres, Crowning and spotting ahead.T-81 from Hollister inbound. Update: 1615hrs - Long trip for first due resources (15 to 20 minutes) Aircraft are overhead. IA: 1610hrs -STF -Large building colume is visible from Columbia. Fire in river drainage, good smoke column showing. Location: Knight mountain area Stanislaus river drainage, Mount Knight area of Tuolumne County, north/east of Columbia and north of Twain Harte. Probably 20 to 25 structures in area. Fuels: Timber with a dense brush understory. Scanner feeds: 411net - http://www.incidentfeed.com. 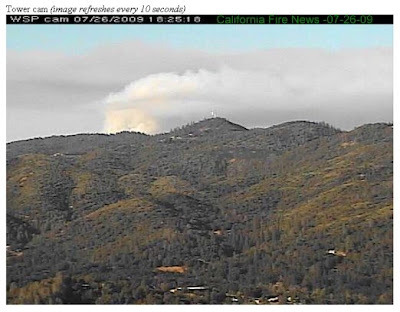 myMotherLode.com features news about the knight fire from KVML the local Tuolumne/Calaveras talk radio stations. They are also in contact with Pat Kaunert and have photos and a map with their news stories.